photo by Kathleen Cameron The Milwaukee, minus 2.3 foot tide, June 2012. Though much is taken, much abides: the remains of the Milwaukee lie buried in the sand beneath these bulkheads. In retrospect, it was a disaster waiting to happen. 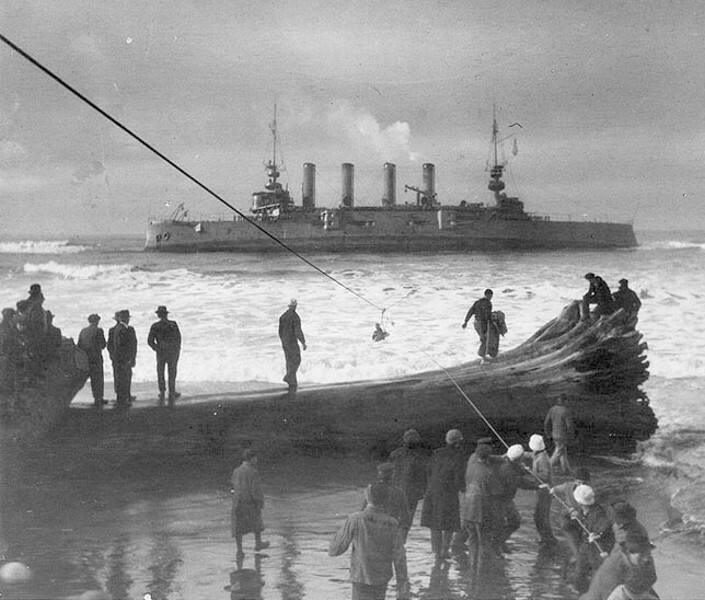 On the night of Jan. 12-13, 1917, three months before the United States entered World War I, the 10,000-ton USS cruiser Milwaukee attempted to free the submarine designated H-3, which had beached at Samoa a month earlier during heavy fog. The plan was to tow the submarine off the sand during a very high tide using thick steel hawsers connecting the stern of the Milwaukee with the sub, while lines to two smaller vessels standing off to the north of the Milwaukee would prevent the 426-foot-long cruiser from swinging around in the south-running tide. So much for theory. The inexperienced commander of the Milwaukee had already dismissed warnings from local Coast Guard officers and the skipper of the H-3, so when propellers cut the line to one of the smaller vessels, he didn't waver in his mission. Big mistake: The second "anchor" ship, the USS tug Iroquois, was unable to hold the Milwaukee in place. The ship slowly drifted around southward, pivoting on half a mile of twin hawsers that tethered the stern firmly — too firmly — to the stricken submarine. Dawn saw the Milwaukee stuck implacably on the beach inside the first line of breakers. The Milwaukee survived mostly intact until 1943, when bronze and other useful metals were salvaged from the wreck for the war effort, using high-explosive charges. You can still see a row of bulkheads at negative tides, like tips of a great iceberg. Below, buried in the sand, lies an estimated two-thirds of the vessel. Locate the site from the big rock opposite Samoa Pulp Lane, 1½ miles south of the west end of Samoa Bridge. 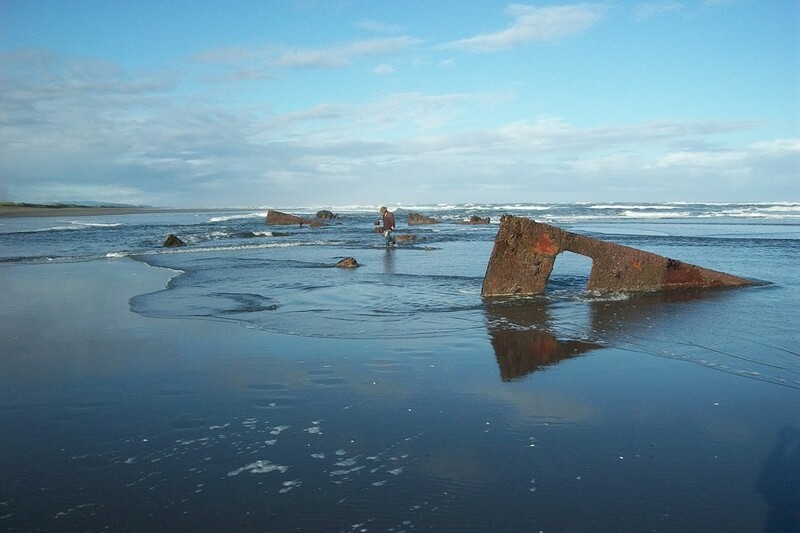 For more on the story, check out local historian Ray Hillman's book Shipwrecked at Samoa, California, available in the Humboldt County Library. Barry Evans (barryevans9@yahoo.com) senses 95-year-old ghosts while walking the beach at Samoa.